Adorable farmhouse style alphabet wood framed signs that are perfect in a nursery, bedroom, playroom, laundry room…and pretty much anywhere! 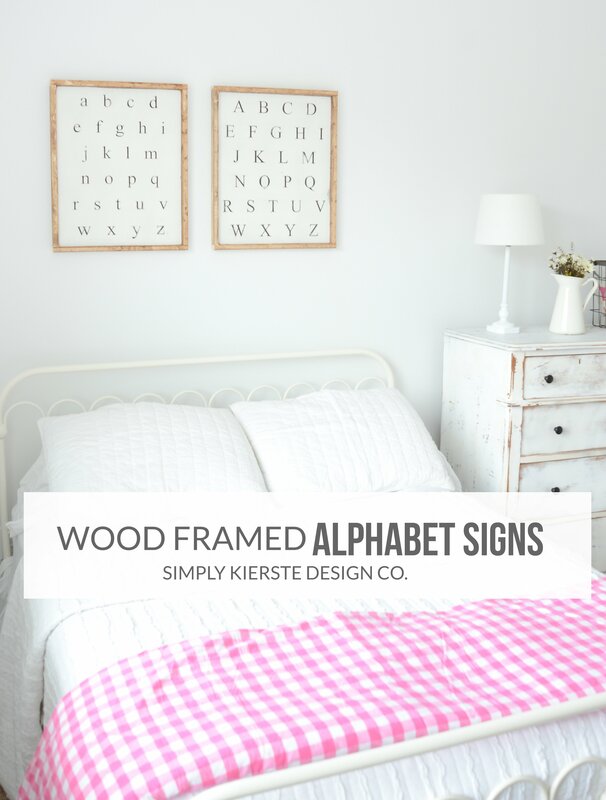 I adore these alphabet wood signs, and they are perfection over her bed. They lend just the right touch of farmhouse style, and I just love the way the wood adds a little contrast to the room. Best of all, they were super easy to make! You can make these in any size you like, but mine are each 16×20 (plus the frame). She has a queen bed, and I wanted them big enough to to fit that space. The supplies list is for the size I made, but you can alter as necessary. Paint your boards with white paint, let dry completely. Stain the furring strips, and let dry completely. Use the power sander to distress the signs as much as you like. Wipe off excess dust. Add the furring strips around the sides of the sign. For all the details on furring strips and how to add them (plus pictures! ), check out my Farmhouse Sign post! And that’s it! The cutest signs ever! !